Something is looking at me with the glare of eyes from a plate…..It’s a Chirimen Jako!!! I loved it before, but without notice, I became not to like it, even feel gross. Their eyes look like as if they are blaming me. 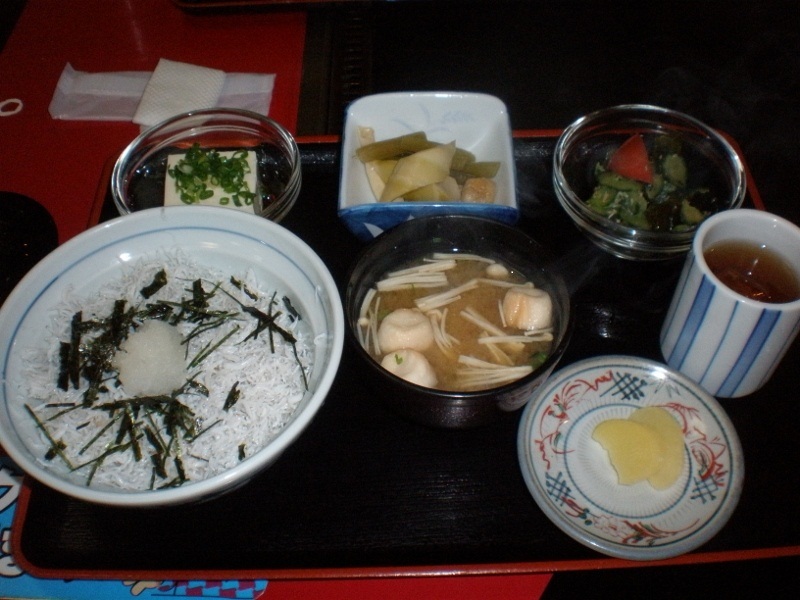 About one month ago, I went to Aki city with my friends for sightseeing and ate lunch there. We got in one restaurant, and the waitress recommended “Chirimen don”, or rice covered with Chirimen Jako. Of course I refused, but my friends ordered. They seemed to be moved by the Chirimen don so much and tried to make me eat that! Then I noticed that there were no bad smell of fish and no glare in their eyes. So I timidly took a bite of it….. “How delicious it is!! !” I was moved. This is my first encounter with Chirimen don. Chirimen Jako is probably not familiar to most non-Japanese people, but it is very popular here. It is the genetic name of young fish of eel, ayu, and sardine. They hatch in the ocean and have clear body. They are very nutritious food which contain a lot of calcium, vitamin, and minerals. Chirimen Jako’s “Chirimen” means a kind of silk fabrics that have fine wrinkles on the surface. And “Jako” means different kinds of young fish. The name “Chirimen Jako” is said to come from the view that those fish are spread and dried on the beach as if there are silk fabrics. Chirimen Jako has another name, “shirasu”. In Kochi, it is popular to call them Chirimen Jako, but in other cities, people usually distinguish those fish by size and dry level. Aki city has been famous for Chirimen Jako for a long time. According to fishermen’s cooperative in Aki, the catch last year was 612t. It means that in the Aki city, Chirimen Jako occupy about ninety percent of fishry share. And In catch of Kochi prefecture, it always comes on first or second. Fishermen dry Chirimen Jako in the sun without any machines by a method passed on from the past. It brings about good flavor and soft texture. Finally, a lot of Chirimen Jako are covered piping hot rice and put vinegar of yuzu, or a kind of citrus. This has been eaten as home cooking and liked everyone there. Recently, there is a movement that make Chirimen don special food to appeal Aki outside. The Aki Chirimen don Association was organized by some different volunteers like Aki Chamber of Commerce and Industry, JA Tosa Aki, and so on two years ago. This group is leading the movement. To be specific about their activities, they sell Chirimen don at events for public relations, produce sightseeing menus like experiencing drying Chirimen Jako, and makes Websites, brochure and a map for eating tour of Chirimen don. On the map, there are 15 stores that serve Chirimen don now and each stores devise the flavor and topping. We can enjoy 15 different Chirimen don!!! 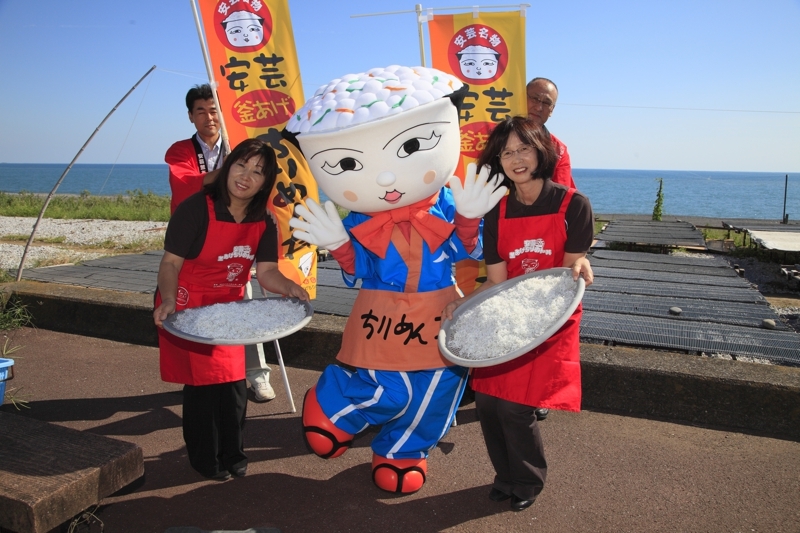 Last year, to promote PR, they got a powerful partner “Chirimen don chan”. She was born by Yanase Takashi, who made “Anpanman” or very famous character in Japan. She is a cute girl who has eyes like Chirimen Jako and a small mouth. The Aki Chirimen don association are also trying to make Chirimen don popular as a “B-grade dish”: which are delicious, but have reasonable prices and we can eat with nothing special. In April 2012, Chirimen don has topped “TheTosa B-1 Grand Prix” which is food festival of “B- grade dishes” in Kochi prefecture. It helped Chirimen don to be known by many people. Now they are thinking of participating in the contest of “B-grade dishes” on a national this year. Those are so meaningful activities. Ozaki Masanao, governor of Kochi. Aki is one of the cities in Kochi that are suffered by serious aging and depopulation, and they are great help for enlivening Aki city. I visited Aki and ate Chirimen don again. The store I went this time served Chirimen don with grated radish and myoga, or Japanese ginger. And the store’s original vinegar of yuzu is so fresh. It made me feel like ordering second and third helpings. There I asked an old woman what she thought of Chirimen don. “Uh, for me, Chirimen don don’t have the freshness,” she answered, “because I have grown up eating Chirimen don. But I’m happy that many people come to Aki to eat that. I feel something proud of in my childhood.” and laughed. Then I told about my story that I scared of Chirimen Jako, but somehow I could eat it and feel delicious here. “Yes,” she answered, “it’s because Chirimen Jako in Aki have hospitality in their eyes.” and laughed again warmly. Please visit Aki in a sunny day. You can see many white spots where Chirimen Jako are spread on the beach. 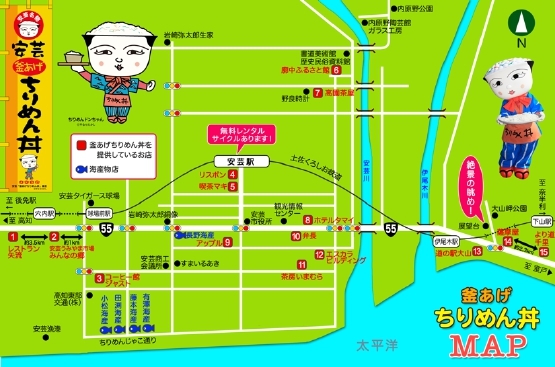 And walk around Aki with Chirimen don map. You will be welcomed by Chirimen Jako and people there with great hospitality. It is great to know that it is known as B-grade dish, now. Maiko, I have to be honest and tell you that Chirimen is not one of my favorite Japanese foods. My youngest son loved chirimen from when he was a baby: he used to eat them like they were chips! Anyway, thanks for spending so much time writing such an interesting story.